Evans studetn Krista Sprankle speaks before her class. While the 2016 United States Presidential Election has been dominating the national news, the students at Evans Elementary School have been focused on a different kind of election. Last week fifth-grade students at the school found themselves in the final stretch of the campaign to elect student council representatives. 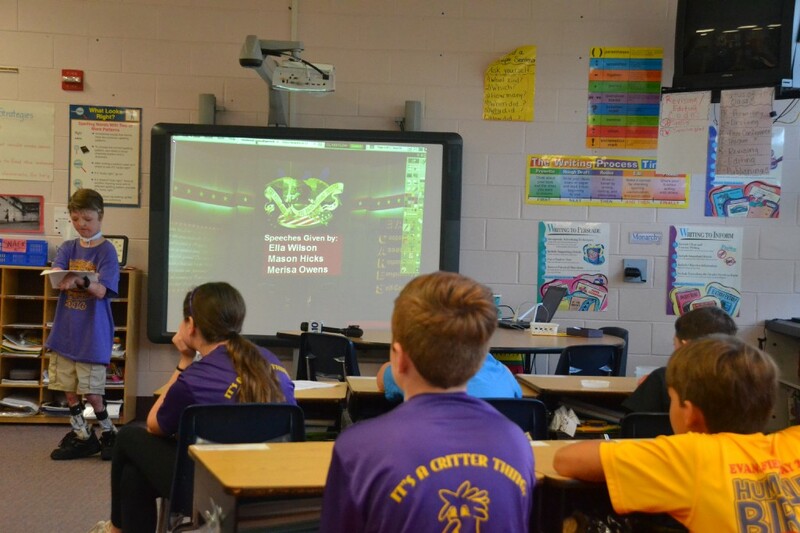 The annual election allows fifth-grade students at Evans to select students who will represent their homeroom classes on the school’s student council. Once elected, the student council acts similar to an actual representative body by brainstorming ways to make the school better and then taking those ideas to the school’s administrators. The election also plays into the school’s social studies unit about power and responsibility. Throughout the campaign students can choose to run for student council, make signs, become campaign mangers and participate in other election activities. During that time students also focus on learning about how the government works, the electoral process and how elected officials are expected to use their power responsibly. Then, much like the election soon to take place on a national level, at the end of the students’ campaign they get the chance to use real voting booths to choose who they believe would make the best leaders. The students who win the election even eventually get sworn-in by Evesham’s Mayor Randy Brown during a formal inauguration ceremony. 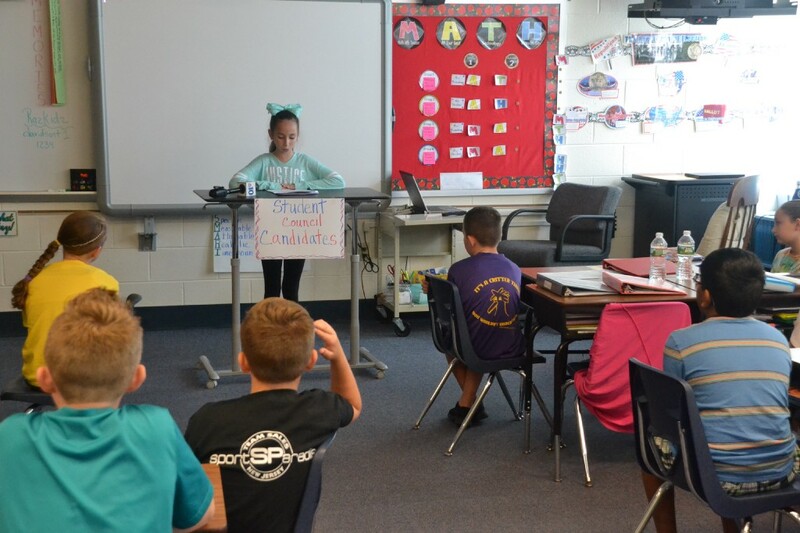 On Oct. 20 the candidates running in the election stood in front of their peers and speeches to convince their classmates as to why they should be elected. One fifth-grade classroom featured just three students running for council, but they all had big ideas. In Ella’s Wilson’s speech, her proposals for Evans included a kindness club and a no technology day where students would not use tablets smart boards in their learning to help the environment by conserving electricity. Ella also said another reason students should vote for her was that she was kind and listens to others, and she mentioned how helps make sandwiches for the homeless and wrote her friend a note to show she cared when that friend lost her dog. “You’d don’t want a mean person for student council. You want a kind person so vote for me,” Ella said. Following Ella was Mason Hicks, who said he should elected because he was also a kind person and would put forth the effort needed to make the school year great for Evans students. Mason spoke about the effort required of him to play sports even though he has braces on his legs and how he still works hard for others. Some of his proposals included the creation of what he called “Friendship Friday” where students would have to do one kind act for a fellow classmate. “I’m kind to people because I know what it’s like to have to try hard at everything,” Mason said. Following Mason was Merisa Owens, and in her speech Merisa asked her classmates to vote for her because she is a good listener and a good role model. Just some of her proposals included having an anti-bully assembly and having the school help an animal shelter. “I feel it is important for everyone to respect each other and I try to listen and be quiet while other people are talking,” Merisa said. After each of their speeches the candidates also fielded questions from the other students and expanded upon their proposals for Evans.